So The Office of the Jury Commissioner for the Commonwealth expected me to come to the courthouse within the next 30 days to serve jury duty. Now I am not in ANY way one to shirk my civic responsibilities. I have served jury duty 4 times and I actually sat on a jury and deliberated in a two day drunk driving trial back in the late 1980's. We acquitted the accused. The arresting officers found him asleep in the back seat of his car at the side of the road at 3:30 in the morning. The arresting officer booked him for drunk driving since he appeared "red eyed and disoriented" when they woke him for questioning. The defendant claimed he was homeless at the time and was living in his car. His defense was he was just sleeping and anyone woken from a deep sleep would be red eyed and disoriented. Seemed like a reasonable defense to me. The state offered no evidence of a field sobriety test or blood alcohol test. While there may or may not have been more to the story, based on the evidence, we acquitted the guy. But I digress. In 2003 when I served, I read a novel and was never called for a trial. I went home knowing I had done my part to keep the wheels of justice turning. The Office of the Jury Commissioner for the Commonwealth said I hadn't served. I needed to show up in 30 days or be arrested. I don't like closing my truck for ANYTHING in the good weather months because it costs me money. I read the letter and called the 800 number. I sensed a bureaucratic, on hold music listening to morning waiting to speak to faceless drones in a largely patronage populated state agency clearing up their oversight. I was right. I explained to the person at the other end of the line my predicament and in very typical state hack language he told me they had no record of my service in 2003 and I absolutely had to appear or face arrest. I kind of flipped out on the guy and said I was OFFENDED that they would brand me a criminal jury evader when I had actually served. I asked him how I could go about getting information from the court where I had served. He gave me another phone number to call. Total talk time (including "on hold" time) for this call: 27 minutes. When I called the court, I explained my dilemma to the guy on the other end of the line. I told him I served sometime in the spring of 2003. I knew this because I remember having a Little League game that night and I remember what level my son was at the day I served on the jury. The guy informed me that they kept no records more than three years old an he had no way of producing any evidence of my jury service in 2003. Total talk time for this call (including "on hold" time): 19 minutes. So now I called the first number again and asked them how they could cite me for evading jury duty 5 years ago when they don't keep records more than three years? The irony was lost on the voice at the other end of the line and we kept coming full circle to the fact that if I couldn't come up with evidence I had served in 2003, I'd have to come in in the next 30 days or face arrest. Total talk time for this call (including "on hold" time): 24 minutes. At this point I figured I might as well go through "the files" at home and attempt to locate the now very important paper I received on the day I served jury duty in the spring of 2003. While going through "the files" I found many things, but nothing remotely resembling evidence of having served. I was resolved that I was probably going to have to sit jury duty for a day, I just needed to find a way to postpone it (like until wintertime) so I wouldn't lose a good volume day at the Hot Dog Truck. The next morning I called the 800 number again, repeated my tale of woe to another bureaucratic drone. I asked him if I got any points for finding a cable TV bill from the last century and he replied that their computers had been reset on January 1, 2000 and they had no online data going back that far. Honestly, the whole concept of humor is completely lost on these people. Total talk time for this call (including "on hold" time): 12 minutes. At this point I was transferred to "LEGAL" to plead my hardship case for extending the 30 day time frame for defaulting on a jury duty evasion charge that I was completely innocent of. I felt an overwhelming sense of dread as the hold music played. Then a funny thing happened. After only 7 minutes on hold, a woman picked up the phone and said "June 5, 2003." "June 5, 2003. That's when you served jury duty." "I got your information from the other gentleman and punched it in on my computer. Its right here. June 5, 2003." "So am I clear on this evasion violation?" "Absolutely sir. I honestly don't even know why we generated that letter. Its quite clear you aren't in default. I'm going to disqualify your default right now." "Will you confirm that in writing?" "Yes sir. 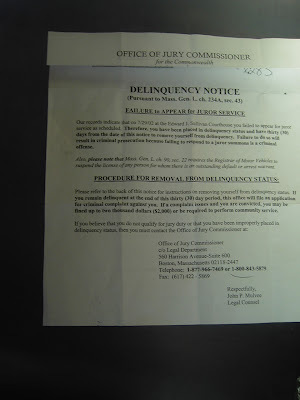 Our office will generate a letter to disqualify your default, you should receive it in the mail in 10 business days." After getting her name and extension number, I thanked her and said goodbye. 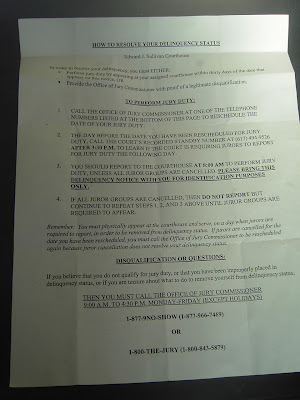 I will be laminating this letter and keeping it with the old cable TV bills for safe keeping. Total talk time for this call (including "on hold" time): 13 minutes. Total talk time for all these calls (including "on hold" time): 98 minutes. back to bloggerwave though - I note that they don't actually state when you will get paid..hmmm I smell something...and it's not hot dogs...The website does not address the issue, I wonder if I can email them? it's a conspiracy! I bet Verizon is behind this whole mess!! still customer service is often a big pain even though i'm in that industry. hmm.